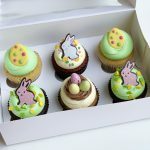 Celebrate Easter with these cute little treats. Our mini tarts are not available for shipping! Something new to add to your Easter Celebration! These mini tarts are filled with dulce de leche, topped with a lucious milk chocolate layer and decorated with a cute Easter bunny on green vanilla frosting. 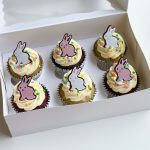 Celebrate Easter with these super cute cupcakes! Including flavors like Carrot, Chocolate, Red Velvet and Vanilla. All topped with Easter Bunnies and colorful Easter eggs. These mini tarts are filled with dulce de leche, topped with a lucious milk chocolate layer and decorated with milk chocolate frosting nest and chocolate easter eggs. Vegan chocolate and vanilla cupcakes, all topped with vanilla frosting, pastel colored confetti and chocolate Easter Bunnies.